Achieve a close and comfortable shave with JASON Mens Shave Oil for Sensitive Skin. 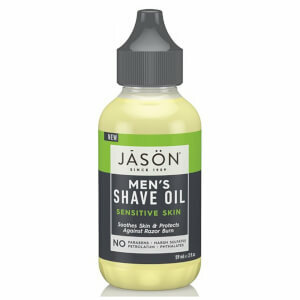 Enriched with Grapeseed, Argan and Castor Oils, the gentle formula softens each beard hair and conditions the skin to improve razor glide and create an extra-smooth shave. Avocado and Tea Tree soothe any irritation or inflammation, whilst protecting against red bumps, razor burn and cuts. With no need to add water, the oil will ensure a quick, easy and comfortable shaving experience. Free from parabens, petrolatum and phthalates.